Bored with the standard method of accessing the Task Manager or want to sue the Menu button for something else? If you answered yes, then you need GoToMenu. This app takes simplicity to the next level as in some ways it isn’t an app at all as it is more of a GUI tweak. 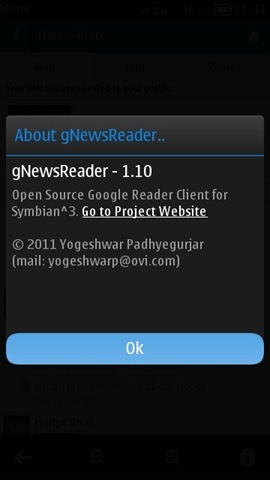 There may be a number of RSS readers available for Symbian^3/Anna devices, but for a while now I watching this development of gNewsReader from a developer project to a premium OVI Store app. 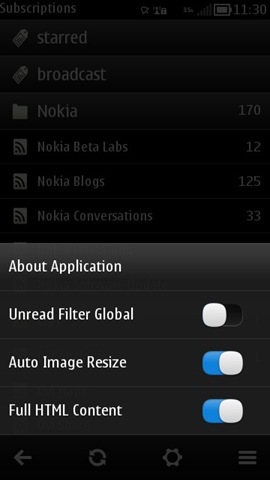 Once the purchased and installed the app conforms to the Symbian Belle GUI format and is very easy to use although there are a small number features available on the Google Reader site that cannot be achieved via the mobile client. The first of these is mark-all-read from the posts list within a specific feeds view, although the it is possible to mark-all-read for a specific feeds from the main feeds list. Secondly, although related, it is not possible to mark a specific post as read without either marking all posts within a feeds as read from the main screen or opening the specific post. Once these limitations are accepted the app layout is simple with the main window displaying a categorised feed list, although it is not possible to categorise feeds via this app (Google Reader site required for classification). Although the category headings display contained feeds the starred, broadcast and blogger-followed headings operate as buttons instead, on pressing which display a list of the posts falling within the relevant categories. A down side about the current layout is that tapping on category headings opens a screen with all posts within this category which could be helpful, but may be aided by providing the option to open a list of contained feeds or contained posts. I accept that the user created categories have contained feeds bellow, but the starred, broadcast and blogger-followed category headings have no form of contents filtering by feed or sharer, etc. 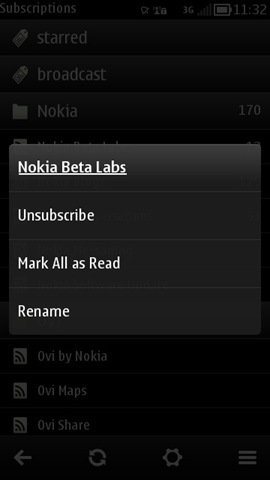 Unread Filter Global – toggle the “Load New Feeds” filter selection between main subscriptions screen and all screens. Auto Image Resize – toggles between showing images resized to fit or not. Subscribe to New Feed – Enables subscription to a new thread by entering the feed URL and an optional title or by pasting the feed from the clipboard. 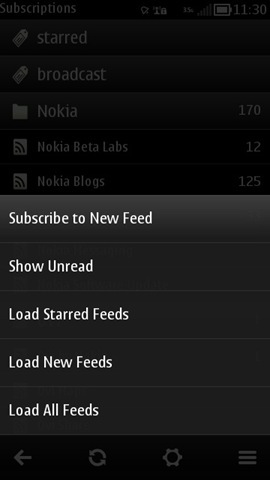 Load Starred Feeds – display feeds containing starred posts only. Load All Feeds – display all feeds. 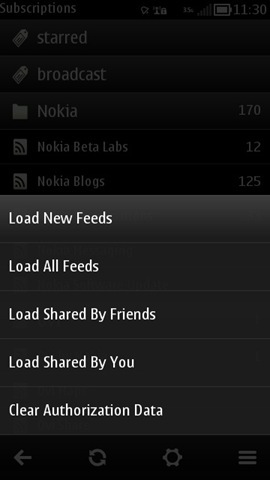 Load Shared By Friends – display posts shared by friends. Load Shared By You – display personally shared posts. Clear Authorization Data – delete Google Reader user information. Additional to the above menu options a long press on a user created category provides mark-all-read beneath that heading and a long press on a feed heading provides a short floating menu enabling the user to unsubscribe, mark-all-read or rename the feed. A tap on the relevant category heading or feed heading opens a new posts screen as discussed above. Once in this view the options a very limited with the bottom (right hand) menu button only providing the option to load more posts, whilst the middle filter icons toggles between showing all posts and only new/unread posts. Once a specific post is opened the screen layout is based on some of the setting from the main screen menus, namely image size and HTML content appears differently based on the toggle location on the Settings Menu. Share to twitter – post a tweet linked to the posts via your twitter account. Share to Facebook – post linked to the posts via your facebook account. Send to Read It Later – save the post to your Read-It-Later account to read off-line later. Send to Instapaper – save the post to your Instapaper account to read off-line later. Add Star/Remove Star – star or remove a star from the post on Google Reader. 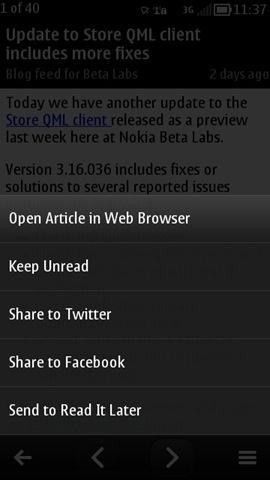 Share/Unshare (Google Reader) – share or unshare the post on Google Reader. Like/Unlike – like or unlike the post on Google Reader. Edit Tags – edit the default tags associated with the posts on Google Reader. Copy URL to Clipboard – copy the post URL to the global clipboard on the phone to paste into other applications. This is a very capable app and is the only RSS app for me as over time I have found using the likes of Google Reader to manage my RSS feed subscriptions. Until the appearance of gNewsReader I used Gravity for my Google Reader needs, but gNewsReader provides the image and full HTML support that Gravity does not. 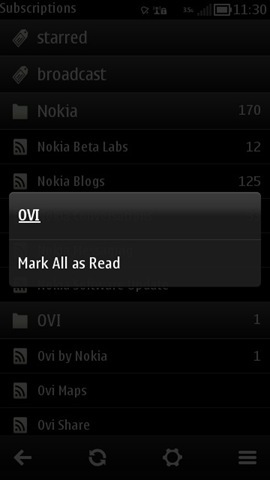 I can see a very bright future for this app and it will be a staple install for my Nokia N8 from now on. Although I have identified a small number of improvements I would like to see, this app is well worth it’s price of £1. 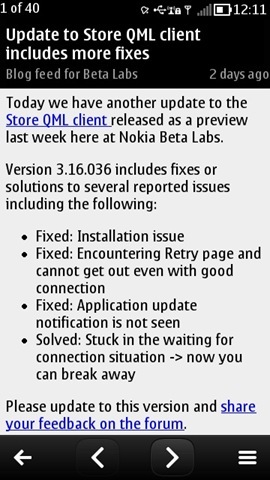 Finally, there is an update on it’s way at the moment, but I have not been able to get my hands on a change log yet. When it becomes available the change log should appear on the developer’s project page. QuickPowerPoint is a sub-app of QuickOffice Pro 7 enabling creation, editing and viewing of Microsoft PowerPoint presentations. One thing to note is that although Microsoft Word supports many different document file formats QuickWord is limited to .ppt (PowerPoint presentation), .pptx (PowerPoint 2007 presentation) and .pps (PowerPoint showe) file formats according to the user guide, although the save as menu does not offer .pptx (PowerPoint 2007 presentation). QuickSheet is a sub-app of QuickOffice Pro 7 enabling creation, editing and viewing of Microsoft Excel spreadsheets. One thing to note is that although Microsoft Excel supports many different document file formats QuickSheet is limited to .xls (Word document), .xlsx (Word 2007 document) and .txt (Test file) file formats according to the user guide, although the save as menu also offers .xlsm (Word 2007 Macro). QuickWord is a sub-app of QuickOffice Pro 7 enabling creation, editing and viewing of Microsoft Word documents. One thing to note is that although Microsoft Word supports many different document file formats QuickWord is limited to .doc (Word document), .docx (Word 2007 document) and .txt (Test file) file formats according to the user guide, although the save as menu also offers .docm (Word 2007 Macro). Historically QuickOffce Pro has always been somewhat of a triple hitter of an app providing Microsoft Office Word, Excel and Powerpoint viewing and editing capabilities to mobile phone users. With the release of version 7 for Symbian the QuickOffice development team have added cloud based file storage/sharing to the product. QuickOffice has been a default install on Nokia devices for a long time now with, in most cases the standard version limited to document viewing pre-installed with the ability to upgrade to the pro version to add editing functionality. 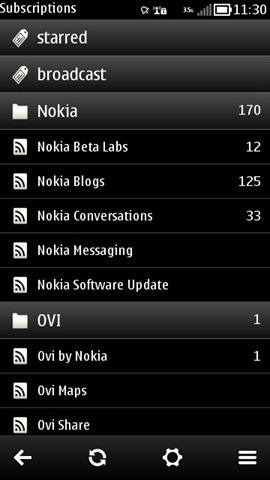 To be honest, in the days of the Nokia N95 although I was impressed with QuickOffice I ended up favouring ActiveNotes due to it’s simplicity, but this app never ported across to S60v5, let along Symbian^3, Anna or Belle. Being a long time Firefox beta user I often hit the issue of add-ons not being compatible with the latest beta. Quite often the issue is not actually compatibility, but the maximum supported Firefox version stated in the installer file (.xpi). Find the Firefox add-in on the Firefox Add-ons pages and right click on the download button to select “Save link as”. Once you have the .xpi file on your PC it’s time to change the file extension to .zip so that you can access the content of the compressed archive. Open the new .zip file and extract the install.rdf file. Replace the install.rdf file within the zip file with the newly modified version. You can now add this add-on to your current version of Firefox. This has helped me out a few time and I hope it helps you too.